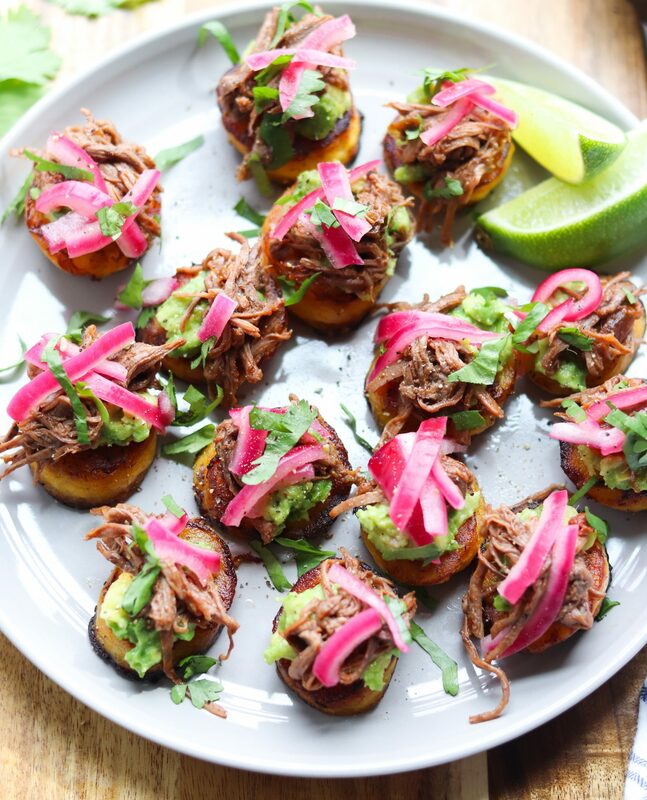 I’m officially naming these Barbacoa Beef and Plantain Sliders “Party Bites,” because (and I haven’t said this since like 9th grade), it’s like a party in your mouth! 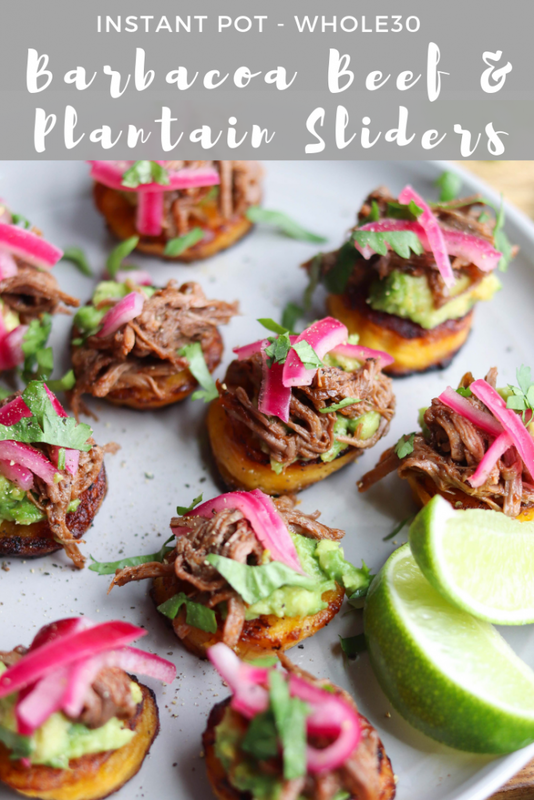 The sweet, crispy, creamy fried plantain slices are topped with ultra tender spicy Barbacoa beef, a little smashed avocado, and super bright sugar-free pickled onions. They’d be a great gluten free or Whole30 appetizer for your picnic or backyard cookout, but I’m just eating them as my dinner tonight. And let’s be honest, any leftovers will be definitely be tomorrow’s breakfast. I used to make my Whole30 Chipotle Barbacoa Beef recipe in the slow cooker, but these days I’m all about my Instant Pot because I’m kind of an Instant Pot fan-girl. Don’t get my wrong, I love my slow cooker too, but my pressure cooker is the absolute best time-saver in my life right now. But don’t worry, even though my poor crock pot has been benched for a while, I’ve included a slow cooker adaptation to the recipe below. But back to the recipe! Fried plantains are absolutely unbelievable! If you haven’t made them yourself yet, I highly recommend them. They’re so simple to pan fry to perfection and just such a great Whole30 snack or side dish to any meal. 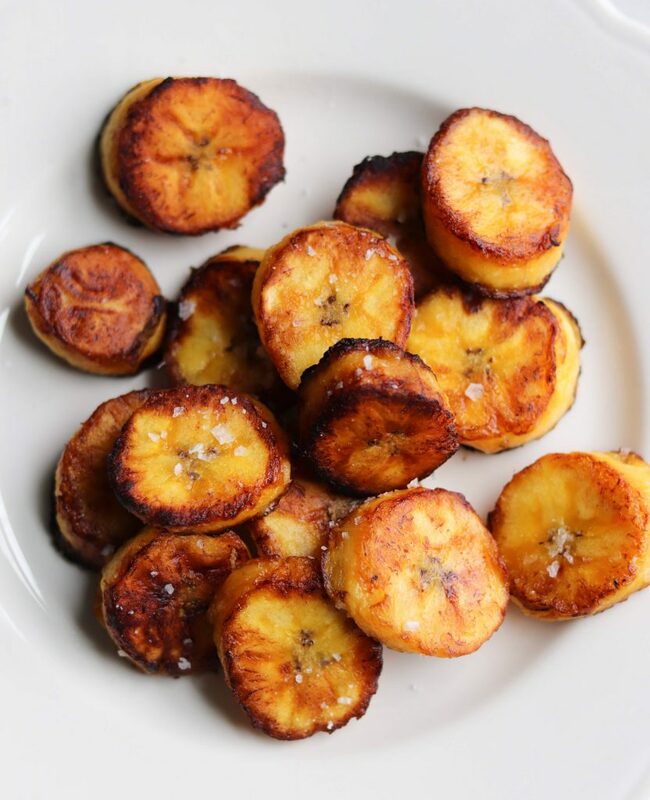 They’re one of my favorite things all by themselves, so you know as I was making dinner last night, a few plantain slices were quickly fried, sprinkled with salt, and dipped in salsa. I had to crack open a Coconut Lacroix, too! Perfect pan fried plantains! Crispy and salty on the outside, sweet and creamy on the inside. Tip: The same way you want to wait until your bananas are brown when you cook banana bread, wait until your plantains go from green to yellow to brown/black before you fry them. I like to wait until the plantains are pretty much totally black with maybe almost no spots of yellow, because then they’ll be perfectly ripe and sweet, soft enough on the inside to only require a quick pan fry. Green plantains are great too, but they’re starchier and need to be cooked a second time. Just do a google search for “tostones” for a tutorial on that! And make sure you make my Whole30 Pickled Onions recipe for this. So many recipes call for added sugar, but you do NOT need it! They’re a total staple in my home, the best and easiest condiment in my Whole30 arsenal. 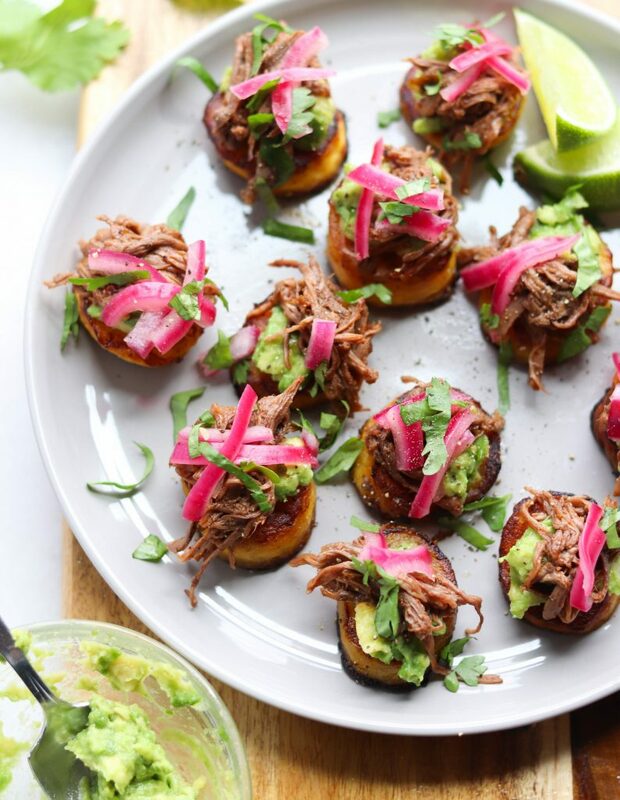 Fried Plantains topped with spicy Instant Pot or Slow cooker Barbacoa Beef, smashed avocado, and pickled onions. Pat your roast dry with a paper towel and season on all sides with salt and pepper. Set the Instant Pot to Saute mode, heat about 3 tbsp of oil, and brown the roast for about 2-3 minutes per side. Add in all the other ingredients and set to High Pressure for 70 minutes. Allow for a Natural Pressure Release. With forks, pull the tender beef apart, setting aside any large fatty pieces. Add the meat back into the Instant Pot and set to Saute mode. Bring to a simmer and cook together for about 3-4 minutes, stirring. Peel and slice the plantains into 1/4 inch slices. In a large skillet, heat coconut oil and ghee over medium heat. In batches, add the plantain slices to the skillet and pan fry for about 1 – 1.5 minutes per side. Like potatoes, they should gently release when they’re ready to be turned (they should be golden brown). Flip the plantains and cook for an additional 1 – 1.5 minutes. Remove them from the pan and set on a paper towel lined plate. Sprinkle with salt. Slice the lime and cilantro. Cut the avocado in half, remove the pit, and smash the flesh with a fork. 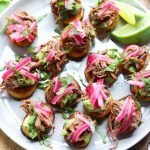 Assemble the sliders by topping each plantain slice with a bit of smashed avocado, Barbacoa beef, and sliced pickled onions. Sprinkle with salt and pepper, a little cilantro and a squeeze of lime! Be sure to get my pickled onion recipe! Place roast in slow cooker (I prefer to brown it on all sides in a large pan first, but a lot of people skip this step and its just fine!). Mix together garlic, cumin, oregano, broth, lime, salt and pepper. Add in 2 to 3 tbsp. of diced chipotle peppers (or substitute 2-3 tbsp. chipotle in adobo, but check the label!). Pour the mixture over roast in slow cooker. Cover and set to low. Cook for 6-7 hours, until the beef is fall-apart tender. Allow to cook together for an additional 15 minutes. 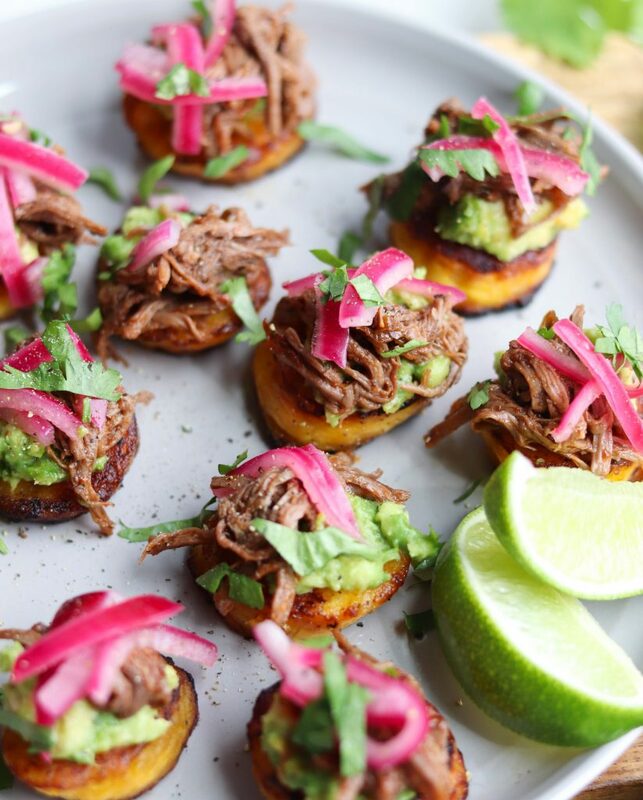 Are you going to make these Whole30 Plantain and Barbacoa Beef Sliders? I’d love to see! Tag me on Instagram @cookathomemom! 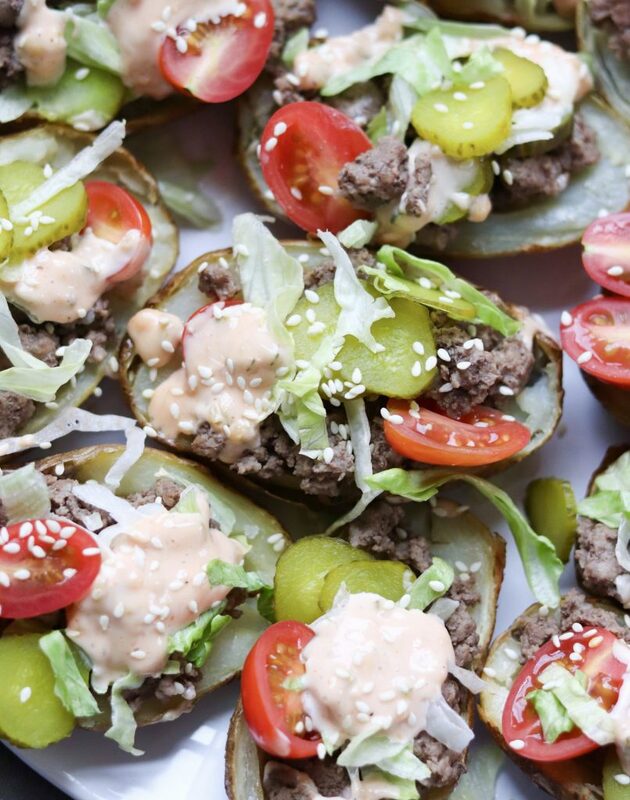 And sure to check out some of my other Appetizer recipes, like these Whole30 Big Mac Potato Skins! They’re always a hit!